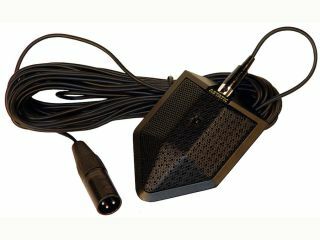 The What: CAD Audio has incorporated its Variable Pattern technology into the Astatic 901, making it the only boundary mic that features a continuously variable polar pattern (cardioid, figure-eight, and omnidirectional), according to the company. The What Else: The polar pattern of the 901VP can be changed locally, by setting the onboard variable pattern control, and remotely, with CAD Audio’s Remote Variable Pattern Control Box (VPC-1) between the microphone and audio mixer. The pattern can also be electronically controlled using the 40-360 DSP cable and corresponding software with compatible digital signal platforms from Biamp and Nexia. When placed on a hard surface, the 901VP will take advantage of the “boundary effect” increase in signal-to-noise ratio. The 901VP is terminated with a TA3M-type connector recessed in the body of the microphone and comes with 30 feet [9.1m] of detachable microphone cable that is terminated with a standard three-pin XLRM-type connector. The 901VP is designed to resist interference from devices such as cell phones and two-way communication devices. The integral 80Hz, 12dB/octave high-pass filter removes unwanted low-frequency energy to improve intelligibility. The all-metal body and shock-absorbing rubber bottom make for easy placement on almost any surface. The Bottom Line: The 901VP is primarily designed for speech and vocal pickup in governmental, institutional, house of worship and corporate applications. The upgraded Astatic 901VP reduces the list of products an audio system designer needs to consider when boundary condenser microphones are specified. The installer can precisely tailor the polar pattern for the best performance depending upon the application or environment.